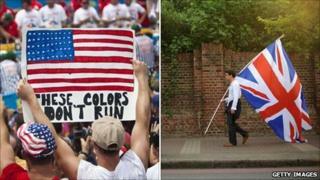 Viewpoint: Why do some Americanisms irritate people? British people are used to the stream of Americanisms entering the language. But some are worse than others, argues Matthew Engel. All of these words we use without a second thought were not normally part of the English language until the establishment of the United States. The poet Coleridge denounced "talented" as a barbarous word in 1832, though a few years later it was being used by William Gladstone. A letter-writer to the Times, in 1857, described "reliable" as vile. My grandfather came to London on the outbreak of World War I and never lost his mid-European accent. His descendants have blended into the landscape. That's what happens with immigration. It's the same with vocabulary migration. The French have always hated this process with a very Gallic passion, and their most august body L'Academie Francaise issues regular rulings on the avoidance of imported words. English isn't like that. It is a far more flexible language. Anarchic even. That's part of the secret of its success. It has triumphed where Latin, French and the artificial language of Esperanto all ultimately failed, and become the natural medium of global communication. This is the version of English sometimes known as "Globish". To use it requires only a rudimentary knowledge of grammar and, so it is said, a vocabulary of a mere 1,500 words. But what the world is speaking - even on levels more sophisticated than basic Globish - is not necessarily our English. According to the Oxford Guide to World English, "American English has a global role at the beginning of the 21st Century comparable to that of British English at the start of the 20th". The alarming part is that this is starting to show in the language we speak in Britain. American usages no longer swim to our shores as single spies, as "reliable" and "talented" did. They come in battalions. In the 1930s, the talkies took hold and represented the first overwhelming manifestation of American cultural power. This was reinforced in the 1940s by the presence of large numbers of US servicemen in Britain and the 1950s marked the heyday of the western. There may have been a brief pushback after that, in the era of Swinging London, as Bill Haley and Elvis faded, and the Beatles and Stones conquered the world, along with words like "fab" and "groovy". In the years since, however, the movement seems to have become overwhelming, unstoppable and almost wholly one way, with the exception of Harry Potter. The first class I call Americanisms, by which I understand an use of phrases or terms, or a construction of sentences, even among persons of rank and education, different from the use of the same terms or phrases, or the construction of similar sentences, in Great Britain. The word Americanism, which I have coined for the purpose, is exactly similar in its formation and signification to the word Scotticism. American culture is ubiquitous in Britain on TV and the web. As our computers talk to us in American, I keep having to agree to a license spelt with an s. I am invited to print something in color without the u. I am told "you ghat mail". It is, of course, always e-mail - never our own more natural usage, e-post. As an ex-American resident, I remain a big fan of baseball. But I sit over here and listen to people who know nothing of the games talk about ideas coming out of "left field". They speak about "three strikes and you're out" or "stepping up to the plate" without the foggiest idea what these phrases mean. I think the country has started to lose its own sense of itself. In many respects, English and American are not coming together. When it comes to new technology, we often go our separate ways. They have cellphones - we have mobiles. We go to cash points or cash machines - they use ATMs. We have still never linked hands on motoring terminology - petrol, the boot, the bonnet, known in the US as gas, the trunk, the hood. Yet in the course of my own lifetime, countless routine British usages have either been superseded or are being challenged by their American equivalents. We no longer watch a film, we go to the movies. We increasingly have trucks not lorries. A hike is now a wage or price rise not a walk in the country. Faze, as in "it doesn't faze me"
Rookies for newcomers, who seem to have flown here via the sports pages. Guy, less and less the centrepiece of the ancient British festival of 5 November - or, as it will soon be known, 11/5. Now someone of either gender. And, starting to creep in, such horrors as ouster, the process of firing someone, and outage, meaning a power cut. I always read that as outrage. And it is just that. I am all for a living, breathing language that evolves with the times. I accept that estate agents prefer to sell apartments rather than flats - they sound more enticing. I accept that we now have freight trains rather than goods trains - that's more accurate. I accept that sometimes American phrases have a vigour and vivacity. A relative of mine told me recently he went to a business meeting chaired by a Californian woman who wanted everyone to speak frankly. It was "open kimono". How's that for a vivid expression? But what I hate is the sloppy loss of our own distinctive phraseology through sheer idleness, lack of self-awareness and our attitude of cultural cringe. We encourage the diversity offered by Welsh and Gaelic - even Cornish is making a comeback. But we are letting British English wither. This is an edited version of Matthew Engel's Four Thought broadcast.